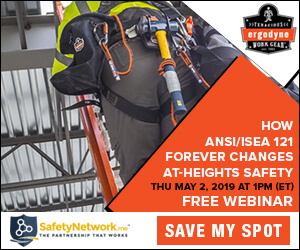 Presented by Sponsor: Intelex Technologies Inc.
Takeaway: Tying incentives to leading safety indicators will encourage employees to be more vigilant and take a proactive approach to workplace safety. Incentive programs can be very appealing to employers and employees alike. Not only do they offer employers the promise of a safer working environment, reduced costs, and lower illness and injury rates, they also provide employees with the opportunities to win prizes, free meals, and even bragging rights. Given the appeal of incentives, companies have used Occupational Safety and Health Administration (OSHA) guidelines to dictate their internal safety performance metrics and incentives, offering bonuses or incentives to employees if they managed to keep the rate of recordable incidents low. However, many safety professionals are of the opinion that incentivizing employees on lagging indicators—that is, incentivizing responses to incidents and other safety events after they have already occurred—has the unintended negative consequence of discouraging them from reporting incidents altogether. Basically, employees become solely interested in receiving the reward, not in ensuring everyone's safety. So, while the implementation of an incentive program can enhance workplace safety, it shouldn't be considered an easy fix or the best solution for addressing occupational health and safety concerns. This article will discuss the problem of tying incentives to lagging safety indicators and explain how to bring about a real change to the safety of your workplace. Most companies continuously strive to improve the safety of their workplaces and the health and well-being of their employees. Unfortunately, those good intentions can sometimes impede that goal: one of the main obstacles to improvement is the significant focus these companies place on lagging indicators of workplace safety. Although lagging safety indicators, such as injury rates and lost work costs, are important factors in determining the safety of the workplace, data about them only reflect the consequences of an unsafe working environment. Because of that, they too often give very little insight into the root causes of safety incidents. In response to the growing trend of incentivizing or rewarding employees for low OSHA recordable incidents, OSHA released the Fairfax memo in March 2012, written by former Deputy Assistant Secretary of Labor Richard Fairfax. The memo outlined ways that incentive programs or reward policies could be “problematic.” According to Fairfax, employees working under such programs and policies know they will receive fewer rewards if they report a higher number of incidents, potentially discouraging them from reporting workplace injuries and illnesses, which is a violation of federal health and safety laws. While OSHA has not adopted any standard or regulation that outright bans employee incentive programs, some companies got the message and have put a halt to them. And it's no surprise. After all, many employers agree that their employees should feel protected and encouraged to report any safety issue or concern and can rest assured that, if they do, those concerns will be addressed. Not only will this help companies achieve their safety goals, it will also foster the development of a culture of safety within the organization—something that incentivizing on lagging indicators can never achieve on its own. Creating an incentive program based on leading indicators of workplace safety—those that allow us to predict and prevent accidents before they happen—is a far more effective approach. Unlike lagging safety indicators, leading safety indicators can help reinforce positive behavior, like the reporting of observed hazard and near-misses by employees. Additionally, because leading safety indicators focus specifically on process-related behaviors and activities, incorporating them into incentive programs is more likely to have a positive impact on workplace safety, especially since these indicators can provide employers with immediate feedback on actions that could lead to unsafe conditions in the working environment. Employees also would have no incentive to conceal or fail to report work-related illness or injury. Instead, a focus on leading indicators encourages them to identify ways to prevent incidents, rather than punishing them if too many of those incidents occur. We can think of this approach to creating incentive programs in terms of the Safety Pyramid, since it's assumed that whatever is reported will be managed and addressed. This means that reporting minor injuries, hazards, and events will result in a proportionate reduction in severe injuries and hazardous events. This approach, moreover, arguably also aligns with the Swiss Cheese model, which holds that reporting hazards and near misses in the workplace enables you to monitor the effectiveness and integrity of your controls. It's clear, then, that incentivizing on leading indicators will not only encourage employees to be more vigilant and take a more preventative approach to safety, but will also promote the development of a strong safety culture, leaving you with a workforce that is less susceptible to accident and injury. Shifting to a high performing safety culture is only possible through equal parts management action (in addressing reported safety hazards or near-misses) and effectively enabling employees to report unsafe conditions (by giving them access to the right tools). Most companies fail to make the shift because they lack a strong safety incentive program, either because of limitations in time, expertise, or resources. One potential problem in making the shift is that encouraging employees to report on leading indicators will only be effective if they can do so quickly and easily, without much effort or disruption to their day. This is where mobile technology can help fill the gap: by changing and improving the way employee safety incentive programs are executed and managed. Emerging technology presents safety professionals with new opportunities to tackle challenges and build engagement with their initiatives, making safety tasks easier to complete than ever before. Mobile technology provides an ease of administration that significantly reduces the time required to handle the data involved in running an incentive program. Mobile devices have also been used in recent years to support strong safety cultures. As safety incentive programs evolve from being reactive to proactive, up-to-date data and real-time reports can be used to communicate changes in the safety performance to managers. So by simplifying data collection with mobile technology, you are not only disseminating the right information to the right people, you are also building employee buy-in with Environmental Health, Safety, and Quality (EHSQ) initiatives and incentive programs, which will ultimately result in higher program adoption and levels of participation. OSHA’s concern is not with safety incentive programs themselves, but with the way that they are often designed. The agency will support safety incentive programs if they are done right. With safety becoming an increasingly prominent workplace issue, safety professionals need to take mobile technology seriously as a tool for managing and executing effective incentive programs. Eric Morris brings more than ten years of experience in safety management and risk mitigation systems. With a history working across multiple sectors, in particular the Oil & Gas and Manufacturing sector, Eric helps organizations design, implement, and establish successful safety management systems that bridge the gap between everyday behaviors, operational hazards, and organization-wide risk. More from Intelex Technologies Inc. Workplace Violence Prevention: What's Your Plan? How can I motivate an organization to update its leadership beliefs? What should I track to take advantage of marginal gains in safety? Why are organizations not including IAQ assessments within their H&S programs? What can EHS leaders do to support sustainability in their organizations? How can we encourage our company's executives to buy in to safety initiatives? How can I raise the safety awareness of my workers? What actions should I take to protect temporary workers under my employment? What is the best way to incentivize your employees when it comes to safety?